The Rundown: The Bandana Splits are a trip back in time to the 40’s and 50’s. Lauren Balthrop, Annie Nero, and Dawn Landes make music that is reminiscent of the doo-wop era with a bit of a modern flare to it. Quite literally, The Bandana Splits are a 50’s band from their sound to their look. The trio has a new 13 track album out called “Mr. Sam Presents The Bandana Splits” which is already garnering sterling reviews in the US and the UK. Lauren, Annie, and Dawn combine in a doo-wop, acapella-esque breath of fresh air to provide some pretty sparkling harmonies along with some pretty groovy songs. The Bandana Splits’ influences are most notably The Ronnetts, and honestly, that should be pretty obvious. 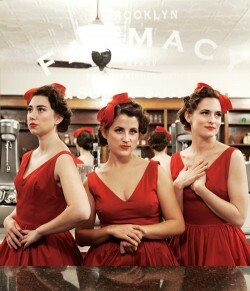 These ladies make some charming and sweet music reminding everyone how music was way-back-when. If you don’t like oldies music and you don’t like The Ronnetts, then you might stay away from these ladies (and there must be something wrong with you). Otherwise, MarsBands.com suggests you check them out.